We're still painting the bounce lines red. As I warned you on Tuesday, there's blood on the streets and we have now picked up 4 red boxes as each index has been taken down a notch this week and, with the Nasdaq (/NQ) failing it's 10% correction AGAIN at 6,870 and the Russell (/RTY) right on the -10% line at 1,495 – will the Dow (/YM) and S&P (/ES) be far behind? For the Dow, that's a 700-point drop to 24,300 and the Dow (/YM) futures pay $5 per point per contract so I love shorting /YM below the 25,000 line with tight stops above. For the S&P (/ES) we're at 2,696 this morning so another 56 point-drop and we're all red on that index too. 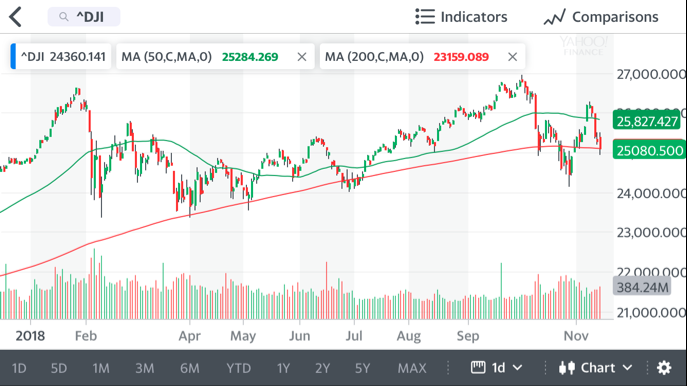 On the other hand, if /ES can get back over 2,710, then playing /YM bullish ABOVE 25,000 with tight stops below would be the smart play – but even fixing Brexit wasn't enough to hold the weak bounce line yesterday for the S&P and Powell didn't save us last night so it's all up to President Trump to make a deal with China that will save the markets – what could possibly go wrong? Oil fell for the 11th consecutive day and is back at the $60 line this morning and we still like it for a bounce but tight stops below. As noted yesterday, $60 is 20% down from $75 and we could overshoot to $57 but, either way, we expect to see at least $63 into Thanksgiving and we did go long on Gasoline (/RB) as well at $1.615 but, so far, that's not working and we'll have to take a loss below $1.60 and wait to see if $57 gets tested on oil, probably lining up with $1.55 on /RB for our next opportunity to take a long poke. Wobbling World Wednesday – Global Indexes Consolidate for the Next Move D... TGIF – Stop the Week – We Want to Get Off!